If the outside temp's over 100, your machine may explode. So keep it inside with the small dogs and grandparents. Don't let the rental company leave before setting it up, or risk blowing out your knees lugging around 175lbs of mechanical fun. Wait a few minutes between rounds: drawing drinks too fast can results in cold tropical soup. Expect a 40min wait for slushification, but to shorten the process, prior to mixing, keep your water in the fridge and your liquor in the freezer. Don't drain the reservoir completely between batches or the dispensing mechanism will ice up and jam, causing angry, daiquiri-craving guests to lash out with plastic cutlery. 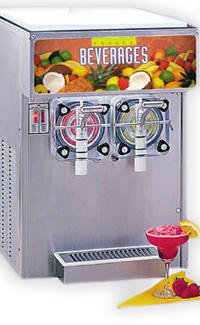 If you're looking to buy, drink machine magnate Mr. Margarita warns against the 3311, recommending the cheaper, more modern Frosty Factory Petite Sorbeteer 117. Of course, you can ignore Mr. M's advice, but don't blame us when you suffer the brain-freezing consequences.